Rose-breasted Cockatoo, Roseate Cockatoo, Willock Cockatoo. The general plumage of the Galah is dark pink. The forehead, the crown, the lores and the nape are whitish-pink. The back, the wings and the tail are grey. The lower abdomen, the vent area, the secondary-coverts, the rump and upper tail-coverts are whitish-grey. The eye ring is rose-red and the iris is dark brown. The feet of the Galah are grey and the bill is horn-coloured. Living in captivity the Galah can become 70 to 80 years of age . In the wild the average Galah will not reach the age of twenty years. A pair of Galahs will bond for life and will be capable of breeding for up to 40 years. 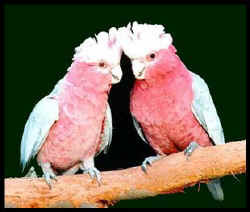 This meant that the offspring of one pair of Galahs became 120 birds after all their breeding years. Female Galah resembles the male but the iris is red. The immature Galahs have a duller plumage. The iris in both sexes is brown. Their eye ring is grey, tinged with a little pink. The common subspecies in aviculture and in the wild through much of Australia is C. r. roseicapillus. A second subspecies, C. r. assimilis, is found in much of Western Australia and is distinguished by a paler grey body colour. The Galah is one of the most widespread of Australia's parrots, being found in all states. It is only absent from the most arid country and from the tip of Cape York. It prefers open grasslands and woodland, is a common species in the cities and towns, and has adapted well to farmed land. The species is gregarious, often forming flocks of several hundreds, although when foraging for food these large flocks will often split into small groups, coming together again at the evening roost site. Feeding is often done on the ground and their food in the wild is dominantly seed, nuts and fruit, and they can cause major damage to cultivated grain crops. For this reason the bird is regarded as a pest species in many parts of its range, and licensed culling is permitted in certain states. The breeding season extends from July to December in the south and February to July in the tropical north. A nesting hollow is lined with leaves and twigs carried into the nest, and usually 3 or 4 eggs are laid. Incubation is shared by both parents over a 30 day period and the babies leave the nest at about 8 weeks old. The Galah, like the Sulphur-crested Cockatoo, is commonly kept as a pet bird, but is rarely bred in aviaries in Australia due to the depressed effect on the price of any progeny. Those breeders prepared to put the effort into genuinely hand rearing Galahs for the companion market will receive a reasonable price for the young Galah. Galahs are an extremely popular cage and companion parrot and the hand reared birds make affectionate companions and often will become proficient talkers. They are not as noisy as the larger Sulphur-crested Cockatoo. One of our Galah hens pure like a cat when ever we go near her, and looks for affection at every opportunity. Like other members of the Cockatoo group, an aviary at least 5 metres by 1.2 metres by 2 metres high is required, constructed of materials to withstand the inevitable chewing that will occur. A nest box around a 60 to 90 cm deep and about 30 cm in diameter should be supplied. An essential requirement is to keep a constant supply of fresh branches of eucalyptus and other native trees available to avoid boredom. A supply of leaves that can be used to line the nest box is also essential. Mate aggression can be a problem if older birds are introduced to each other but seems to be less of a problem with birds that are paired up at a young age. Another problem with breeding birds is that they seem to be very clumsy, and broken eggs are by no means uncommon. There appears to be no easy solution to this, although a nest box mounted at an angle or a nest box with a bottom chamber off to one side, so that the parents do not jump down onto the eggs, may be helpful. Alternatively patience is useful, since the problem seems to decrease with age. The diet needs to be varied, balanced and interesting. A variety of seeds such as wheat, hulled oats, canary, and some grey striped sunflower, should be provided as well as a wide range of fresh vegetables and fruit. Animal protein is also beneficial, given by way of chicken or chop bones, mealworms or other grubs. A tendency of the species to become overweight should be guarded against, and there are arguments for the use of pellets rather than seed for the Galah. The encouragement of flying by the birds is also helpful. Galahs have a tendency to prefer to climb around the aviary rather than fly, and so careful siting of perches and food dishes can help to ensure the birds have to do some flying. A lutino Galah is becoming well established in Australian aviaries, while cinnamon, silver, and grey and white mutations are also known to exist. The Galah is a noisy, very hardy parrot. Because it is a hard chewer, the Galah must be provided with a regular supply of fresh branches with leaves. Regular worming is also essential as birds enjoy being on the ground. The aviary should measure 6 x 1 x 2 m (18 x 3 x 6 feet) and made of a metal construction only. The Galah must be protected from frost in winter. An inside area with outside flight is ideal. A thick-walled, hardwood roosting box 40 x 40 x 90 cm (16 x 16 x 36 inches) or tree stump is also necessary. Their diet: sunflower, pumpkin seed, small seed mix (safflower, millet, hemp, oats, wheat), pine and other nuts. They also need plenty of fruit and vegetables, especially apple and peas. Avocado is not to be fed to any parrot due to the harmful effect and possible death that may occur. Green food is always appreciated. They like small quantities of stone fruit and sprouted seed. The Galahs scatter some seed on the ground. Breeding is regularly achieved. The Galahs will start breeding on their third year and sometimes even on their second year. You will have to provide the Galahs with branches with leaves for nesting material. A partially block entrance to the nest box made of softwood. The Galahs will be chewing on it, this stimulates breeding. The clutch usually consists of 2 eggs up to a maximum of 5 eggs. The incubation period is 30 days and the fledging period 8 weeks. The galahs have to be provided with more animal protein before and during the breeding. The Galah can make an excellent pet, with even wild caught young birds capable of becoming affectionate and friendly birds. They will however often become a little unpredictable when mature, and should never be allowed to spend time on a shoulder. They are extremely playful and intelligent birds, which, like most cockatoos, need constant stimulation with toys to play with, and objects to chew, to keep them from getting bored. They are not generally noisy, apart from early morning and evening, although some are the exception to the rule. Both sexes can become good talkers, possibly with the males being somewhat better, however their talking ability is not usually on a par with either Sulphur-crested Cockatoos or the Corellas. Is broadly elliptical to elliptical-ovate white in colour with very slight gloss.